Hundreds of people marched through the streets of Gaza City for the funeral of 8-month-old Layla Al Ghandour. 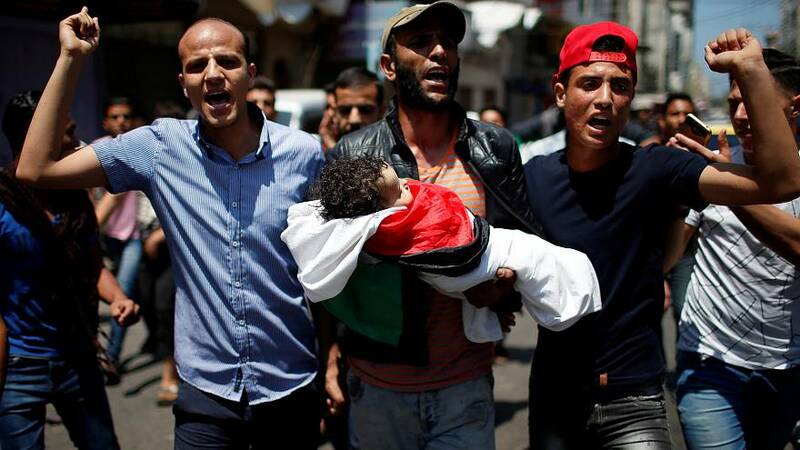 They carried her tiny body, wrapped in a Palestinian flag. It's just one of the dozens of funerals taking place in the Gaza strip after Monday's clashes between Palestinian protesters and Israeli troops, the region's worst day of violence there in four years. Although the baby's family blames Israeli forces, an unnamed doctor told reporters the child had a pre-existing condition. "I went looking for my daughter and they told me she was taken to the hospital. I went to the hospital and I knew she was dead." "They did not have mercy on a girl, they threw gas bombs at her, they killed her with tear gas. They did not have mercy on the children or anyone else. What is she guilty of to die like this?" 60 people have died following Monday's clashes between Palestinian protesters and Israeli troops. Around 2,250 were also injured by either gunfire or tear gas. "What happened was a real massacre. Yesterday we received 500 injuries in this hospital, mostly in the lower limbs, this is more than 25 times the capacity this hospital can deal with. It's a huge challenge for us to cope with this number of injuries." Monday's violence took place as the US opened its new embassy in Jerusalem. Israeli tactics of using live fire against protesters have drawn worldwide condemnation. The UN Security Council plans to meet to discuss the situation. Meanwhile, Palestinian President Mahmoud Abbas has called for three days of mourning and a general strike. Traditionally, May 15th is the day Palestinians mark the 'Nakba' or 'Catastrophe'. But this year, they have even more reasons to grieve.